Another reason to fall in love with fall? Pumpkin! I adore (see that was different) pumpkin so much, I feel like 'Bubba' on Forest Gump when he expresses his love of shrimp, only my obsession is pumpkin. You can make pumpkin bars, pumpkin cookies, pumpkin granola, pumpkin cake, pumpkin seeds, pumpkin pie, pumpkin coffee, pumpkin lattes, pumpkin puree... the list is endless!! 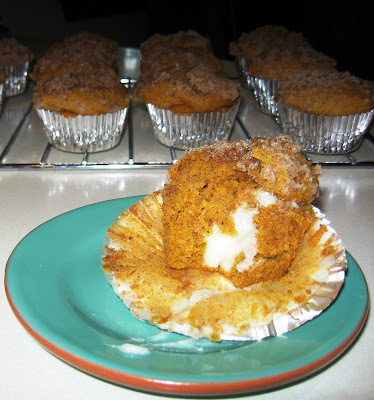 I will stop at pumpkin muffins, because this recipe is well worth a blog. Combine the cream cheese and confectioners’ sugar in a medium bowl and mix well until blended and smooth. Transfer the mixture to the center of a 12" piece of wax paper. Now, put the two ends of the wax paper together and gently press the cream cheese mixture towards the closed end using the flat edge of a baking sheet or ruler until it forms a log about 1 inch in diameter. Then, place mixture in freezer for a minimum of 2 hours. Preheat the oven to 350˚ F. Line muffin pans with paper liners. In a medium bowl, combine the flour, cinnamon, nutmeg, cloves, pumpkin pie spice, salt and baking soda; and mix together with fork. In another bowl, combine the eggs, sugar, pumpkin puree and oil. Mix with an electric mixer on low speed until blended. While mixing, slowly add in the dry ingredients until fully blended. Combine the sugar, flour and cinnamon in a small bowl; whisk to blend. Add in the butter pieces and cut into the dry ingredients with two forks until the mixture is coarse and crumbly. Transfer to the refrigerator until ready to use. Fill each muffin well with about a tablespoon of batter. Slice the log of cream cheese filling into 24 equal pieces. Place a slice of the cream cheese mixture into each muffin well. Divide the remaining batter among the muffin cups, placing on top of the cream cheese to cover completely. 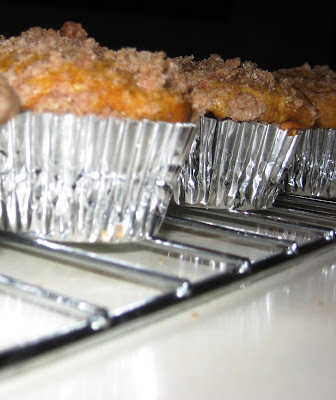 Sprinkle a small amount of the topping mixture over each of the muffin wells. I honestly cannot describe the aroma these little puppies created in my kitchen! It's was heavenly! I couldn't resist and only waited about 3 minutes before I took a bite. Be careful though, that cream cheese center was quite hot! The middle was ooey and gooey, and the muffin... oh so pumpkiny! One of my closest friends, Mrs. Munson, said they were, "To die for!" I sure hope you think the same!